If you don't have time or you are not keen to start reading all the information offered through the menu on the left, here you will find answers for a few questions that will help you to understand the beauty and capabilities of this part of science known as Crystallography. What is Crystallography and what is it good for? Using crystals we can determine the atomic positions within matter. This can be applied for crystals made of either living or inanimated matter. Crystallography is a branch of science that examines crystals. 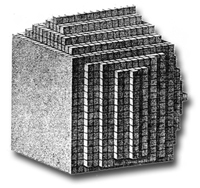 Today we know that crystals are made of matter, atoms, molecules and/or ions that fit together in repeating patterns, called unit cells, which like bricks stacked in three dimensions form the crystals. 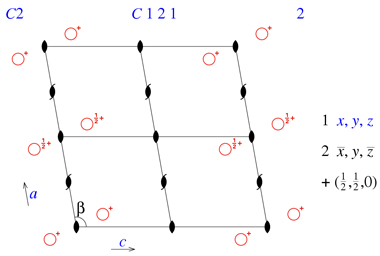 Inside the unit cells atoms are also repeated by symmetry operations. 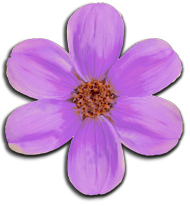 These patterns cause the crystals to show many sorts of unique shapes which for thousands of years have drawn our attention for their colors and outer beauty. With the crystallographic tools developed during the 20th century, we can find out the inner structure of matter, living or inanimate, from which crystals are formed. To know the inner structure of matter means to determine the positions of all atoms and how they are linked together, in many cases forming atomic clusters known as molecules. The atomic structure of matter generates knowledge that is used by chemists, physicists, biologists, and other scientists. This allows us not only to understand the properties of matter, but also to modify them for our benefit. 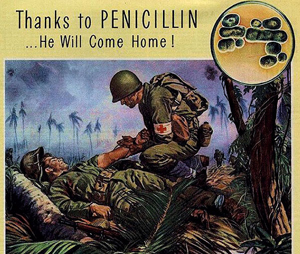 Only after the molecular structure of penicillin was unambiguously determined in 1945 by Dorothy Crowfoot using crystallography, chemists could start the synthesis of this compound, thus saving millions of lives. Where does the word Crystallography comes from? The word crystallography defines the science that "deals with the shapes and structures of crystals". The word "crystal" comes from the Ancient Greeks κρύσταλλος (crustallos, or phonetically kroos'-tal-los = cold + drop), who used the word crystal to refer to the mineral quartz, meaning both “ice” and “rock crystal”, that is cold and hard. Many minerals have always attracted our attention for its beautiful shapes and colors. 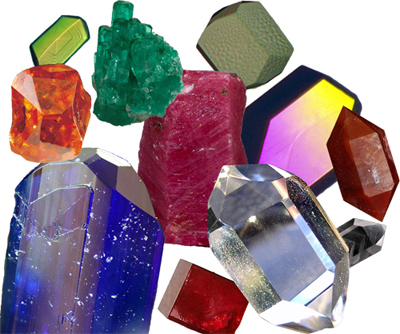 There are references that relate Sumerians with the use of some mineral crystals in magic formulas, Chinese in its traditional medicine, and Egyptians that used crystals as jewels or in powder form for cosmetic purposes. In its origins, Crystallography was dedicated exclusively to the study and description of the external appearance (morphology) of crystals, mainly minerals. 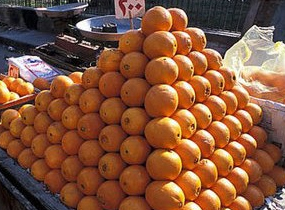 Over time we have found that crystals are ordered matter, ie, made up of atoms, ions and/or molecules perfectly stacked, as one can normally see pieces of fruit in a market. This packing is responsible for the striking forms that crystals normally show externally. Today Crystallography still deals with crystals, but its interest is mainly focused on their internal structure, not in their external shape. When and how crystallography began as a science? 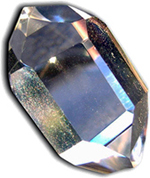 Although the first historical references to the use of crystals comes from the Ancient Sumerians (fourth millennium BC), it was not until the 17th and 18th centuries when the first scientific hypotheses about the inner nature of the crystals appeared, and all of them based on the observation of their external morphology. The German Johannes Kepler (1571-1630) was surprised by the fact that snowflakes landing on his coat always showed perfect six-cornered symmetry and never showed five of seven corners. He explained his observations in terms of the particle packings, as oranges show in the picture above. 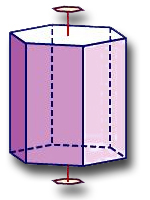 Also based on the observation of crystal morphologies, the Danish scientist Niels Stensen (1638-1686) and the French mineralogist Jean-Baptiste Louis Romé de l'Isle (1736-1790), established the law of constancy of angles between faces of different crystal specimens of the same species. With all this, René Just Haüy (1743-1822), another French mineralogist, commonly styled the Abbé Haüy, concluded that the crystals were made by the ordered stacking of small bricks, or unit cells, all of them identical. the concept of lattice, ie, the repetition rules by which objects or motifs are repeated by translation in an ordered manner (for example, the drawings in a wallpaper). In 1830, the German physician Johann Friedrich Christian Hessel (1796-1872), using the previous deductions of René Just Haüy (1743-1822), and after demonstrating that rotation axes can only be of orders 2, 3, 4 and 6, showed that the different possible morphologies of crystals can be combined to give exactly 32 different combinations of symmetry elements (the 32 point groups, also known as crystal classes). 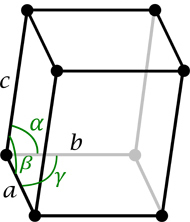 In 1848 the French physicist Auguste Bravais (1811-1863) discovered that in the three-dimensional space, periodic repetitions by translation can only be made in 14 different modes (the so-called 14 Bravais lattices), as they must to be compatible with the 32 crystal classes. Finally, some 50 years later, the 14 Bravais lattices and the 32 crystal classes were the limitations that the Russian mathematician, crystallographer and mineralogist S. Evgraf Fedorov (1853-1919) and the German mathematician Arthur Moritz Schoenflies (1853-1928) used to independently deduce, between 1890 and 1891, the 230 space groups, which are the 230 possible ways to restrict distributions of repetitive structural units of the crystals (atoms, ions and molecules). However, although these findings on the laws governing the structure of crystals were very important, they couldn´t help to solve the fundamental question: what is the size and shape of molecules inside the crystals? Or in short, what positions do atoms occupy in a crystal? Unfortunately, optical microscopes and visible light are not able to see such small pieces of matter as scientists imagined atoms to be! 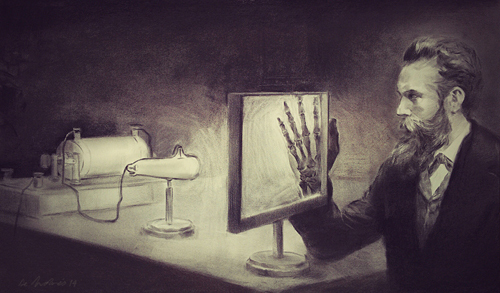 The discovery of X-rays in 1895. (Ilustration by Alejandro Martínez de Andrés, CSIC 2014) The discovery of X-rays by Wilhelm Conrad Röntgen (1845-1923) in the late 19th century completely transformed the old field of Crystallography, which previously studied the morphology of crystals, mainly minerals. Although the discovery of this new "light" gave Röntgen a great popularity, it faded quickly. It took years until the utility of their amazing "light" was recognized as of medical interest, and even allowed him in 1901 to won the highest scientific award, the first Nobel Prize in Physics. Laue showed in 1912 that X-rays are electromagnetic waves and that crystals have a regular internal structure. If Röntgen's discovery was important for the development of Crystallography, it was especially due to the experiment conducted in 1912 by Max von Laue (1879-1960), who convinced by his friend Paul Peter Ewald (1888-1985), decided to demonstrate the ondulatory nature of X-rays and discovered the phenomenon of X-ray diffraction by crystals. He showed that X-rays are electromagnetic waves with a wavelength of about 10-10 meters and that the internal structure of crystals is regular, as if they had tiny slits of that order of magnitude, formed by the distances between atoms. Indeed, after lighting a crystal of copper sulfate with X-rays Laue found that a photographic plate showed black spots not only at its center (as due to the fact that the incident beam passes directly through the crystal), but also in other places of the photographic plate, far away from the center. This result was interpreted as a consequence of the phenomenon called diffraction, whereby the X-ray beams scattered by the atoms interfere with each other inside the crystals and deviate from the central beam. 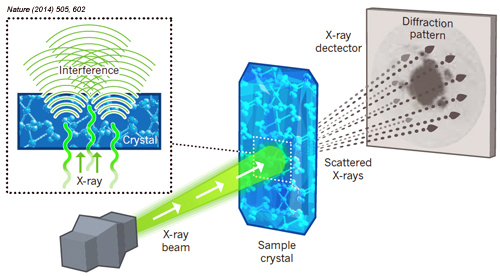 crystals behave as diffraction slits, with dimensions equivalent to the wavelength of X-rays. Crystals diffract X-rays. What is it useful for? First diffraction pattern obtained by Max von Laue in 1914 using a crystal of copper sulphate and scheme on which the Bragg’s based their interpretation to deduce the internal structure of the crystals from the diffraction pattern. 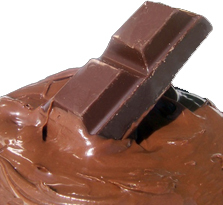 It did not take long until the Max von Laue's discovery was recognized as very important. In fact, in the same year of Laue's experiment, William Henry Bragg (1862-1942) and his son William Lawrence Bragg (1890-1971) realized that if atoms inside crystals diffract X-rays and give rise to a diffraction pattern, this pattern should contain enough information to extract the relative positions of atoms in the crystal, that is to go backwards and retrace the path of diffraction. 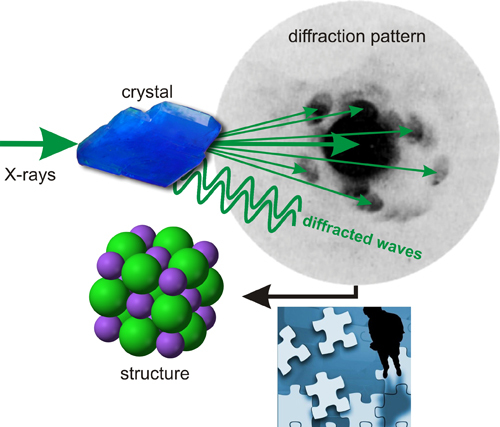 These scientists interpreted the phenomenon of diffraction with a simple geometric law: atoms in crystals occupy virtual planes that behave as mirrors, but reflecting X-rays only for certain angular positions of incident X-rays (Bragg's law). Father and son shared the Nobel Prize for Physics in 1915 for demonstrating the usefulness of the phenomenon discovered by von Laue in studying the internal structure of crystals. Bragg's discovery produced a scientific revolution, because the expectative of looking into the inner structure of matter was equivalent to unravel the mysteries of the world around us. To prove their theory, Bragg were able to determine the atomic structure of simple materials such as sodium chloride (common salt) or the mineral blende (zinc sulfide). Although in those years these researchers were not able to solve the structure of more complex materials, over the time Crystallography has been able to answer a very large number of fundamental questions on various aspects of both inanimate and living matter. 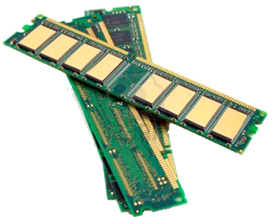 Structural knowledge obtained by Crystallography allows us to produce materials with predesigned properties, from catalyst for a chemical reaction of industrial interest, up to toothpaste, vitro ceramic plates, extremely hard materials for surgery, or certain aircraft components, just to give some examples of small, or medium sized atomic or molecular materials. How can atoms "be seen" with X-rays? Although W.H. Bragg and W.L. 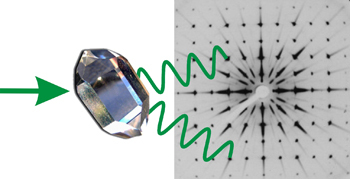 Bragg’s findings opened unexpected ways to gain knowledge on the internal structure of matter, these two researchers were already aware that going backwards, that is, stepping from the diffraction pattern to the atomic positions in the crystal) implied to unravel the secrets of the puzzle implicit in the diffraction pattern. When the X-ray waves pass through a crystal they interfere with each another, giving rise to waves that deviate from the line defined by the incident beam. When these new waves reach the photographic plate they produce a snapshot characteristic of each crystal species (such as a fingerprint). This is what we call diffraction pattern. Example of how the two waves, shown at the top, add or subtract (depending on their relative positions), to generate a resultant wave (thick line below). Animation taken from The Pennsylvania State University. Two resultant waves, each one with its own amplitude (intensity) and a relative phase, generate two separate spots in the diffraction pattern. The intensity of each spot is proportional to the amplitude of the corresponding wave, and each wave travels with a different relative phase. 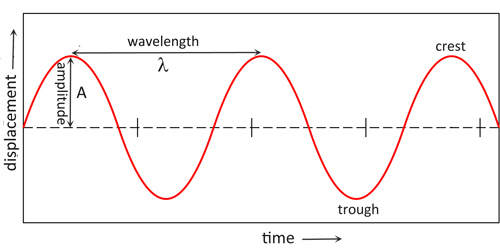 And although we cannot see them with our eyes, each of these waves is added to (or subtracted from) its neighbors, being reinforced or decreased, generating a resultant wave, as shown in the figure on the left. The resultant waves in each direction of diffraction are produced by the interferences occurring between the waves produced inside the crystal, a phenomenon entirely dependent on the relative positions of the atoms in the crystal. 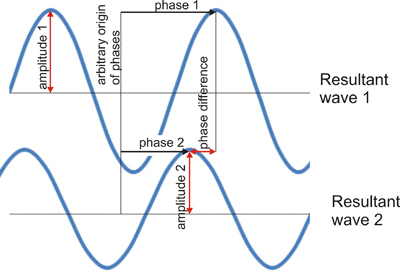 If the resultant waves (each one with its intensity and phase) that generate the diffraction pattern depend on the atomic positions in the crystal, reversely, in order to determine the atomic positions from the diffraction pattern, we will need to know the intensities and phases of each wave. the process of determining the internal structure of crystals is not an easy or direct job. But, once the intensities of all diffracted waves are measured, if we are "somehow" able to find out their relative phases, there is a simple way (although with some numerical complexity) that allows us to determine the positions of all atoms in the crystal, that is, to calculate a three-dimensional picture of the inner structure of crystal. 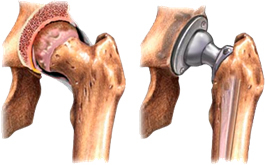 And this procedure applies for both living and inanimate matter. Between the atomic positions in the crystal and the diffraction pattern there is a holistic relationship. The position of each atom in the crystal depends on the information existing in the diffraction pattern (wave intensities and relative phases). Conversely, the intensity and relative phase of each diffracted wave, shown as a spot in the pattern, depends on the position of all atoms in the crystal. 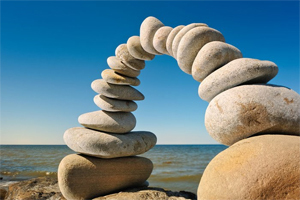 Between the arc and the stones there is a holistic relationship. The arc depends on all and everyone of the stones.Image taken from definicionABC. Is this methodology similar to an optical microscope? Although it has been said that determining the internal structure of crystals is not an immediate procedure, it resembles the process of watching a tiny object through an optical microscope. For example, to see the details of a fly wing (what we cannot distinguish directly with the naked eye), we put the wing on a slide, which is illuminated with visible light. Light passing through the wing is refracted producing various waves (with their intensities and relative phases) that go through a system of lenses that are able to "combine" these waves (with their intensities and phases) and produce an enlarged image showing the tiny details of the fly wing. 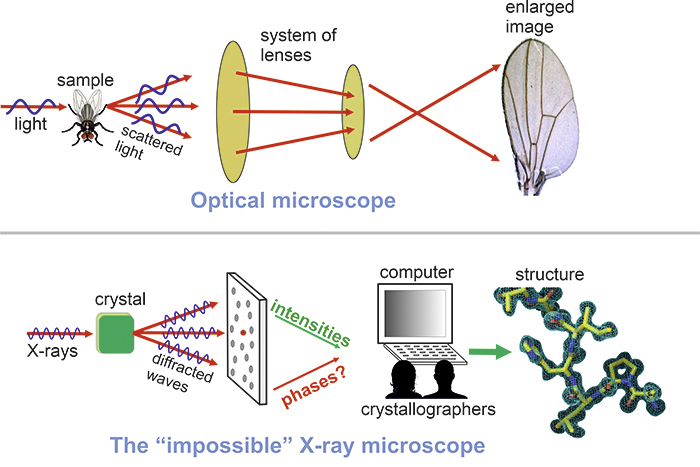 In what we might call the impossible X-ray microscope, the object being observed is a crystal that is illuminated with X-rays, instead of visible light. 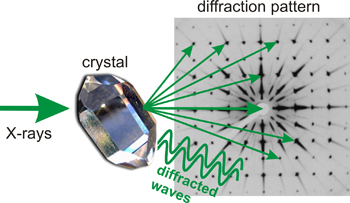 The waves of "light X” are diffracted by the crystal. But unfortunately, technically speaking there is no system of lenses able to "combine" diffracted waves of X-rays, with their amplitudes and phases, and therefore we have to be satisfied with the only thing we can measure on the diffraction pattern: the amplitudes (=intensities). Why do we use crystals instead of isolated molecules? Some readers will probably wonder why we use crystals (packed molecules) to "see" atomic positions, rather than using isolated molecules. The answer is quite simple. The interaction of X-rays with matter is very weak and if we irradiate an isolated molecule with X-rays, we get an interference pattern which contains very poor scattered information, making it difficult to reconstruct the structure of molecules from these interferences. However, when a crystal is irradiated, the ordered molecular packing makes the crystal to behave as a very powerful amplifier. The cooperative interferences, called diffraction, produce a pattern containing much more information than the one created by an isolated molecule. 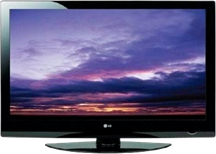 What kind of information contains a crystal structure? The crystal structure contains full information, not only about the spatial positions occupied by all atoms, but also on their thermal vibrational states. From these positions we can also derive if atoms are bound forming molecules, and easily calculate all type of geometrical parameters, including bond lengths, bond angles, etc. 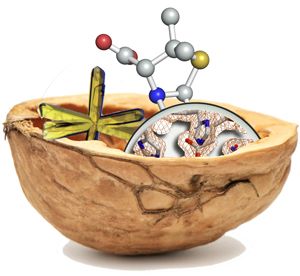 In addition, the structural crystallographic data also show very rich information about how molecules interact with each other, through attractions or repulsions. 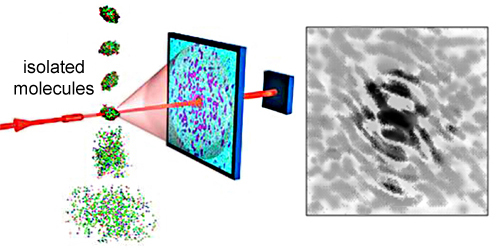 Two mirror-image molecules Crystallography is even able to distinguish between a molecule and its mirror image (see left image). 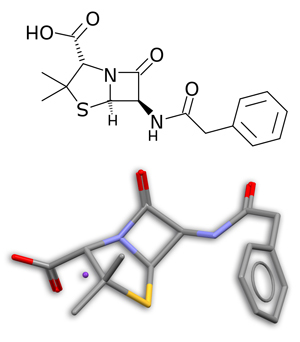 These molecules seem to be the same, but they are quite different, and so are their properties. Think for instance on our two hands; they seem to be "equal", but in reality they are very different; they are not superimposable, they are mirror images. 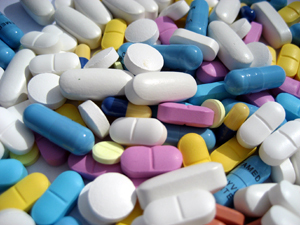 The three-dimensional shape of a molecule relates to how the molecule will work in a chemical reaction, in a test tube, or inside a living being. Once the relationship between the structure and properties is understood, it is often possible to modify or design new materials or molecules with specific desired properties. Today, crystallographers study the atomic structure of any material that can build a crystal, from very simple substances to viruses, proteins or huge protein complexes. But they also investigate a wide variety of other materials, such as membranes, liquid crystals, fibers, glasses, liquids, gases and quasicrystals. In short, the atomic and/or molecular structure that Crystallography provides contains the most relevant information to understand the properties of materials, so we can modify them to our benefit. Crystallography allows us to know all geometrical details (interatomic distances, bond angles, etc.) 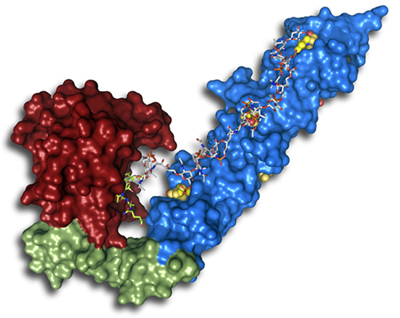 of molecules, even for huge protein complexes. 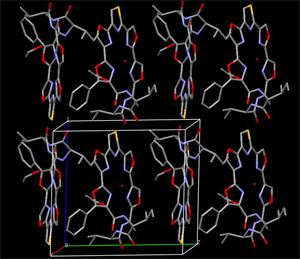 Crystallography provides full details on both molecular packing and intermolecular interactions. 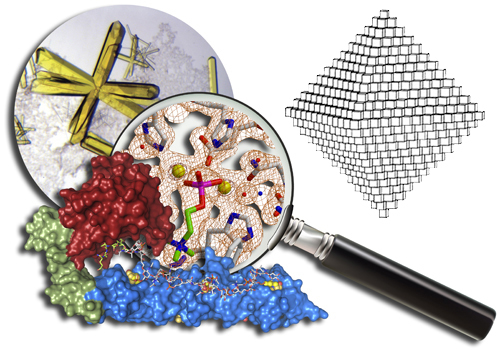 The structures of most known materials (inorganic, organic, metal-organic, proteins, enzymes, nucleic acids...) are available through specialized databases that are continuously updated. Even if you do not pretend to know anything more about crystallography, we hope this summary has clarified some ideas about this powerful and beautiful branch of modern science.